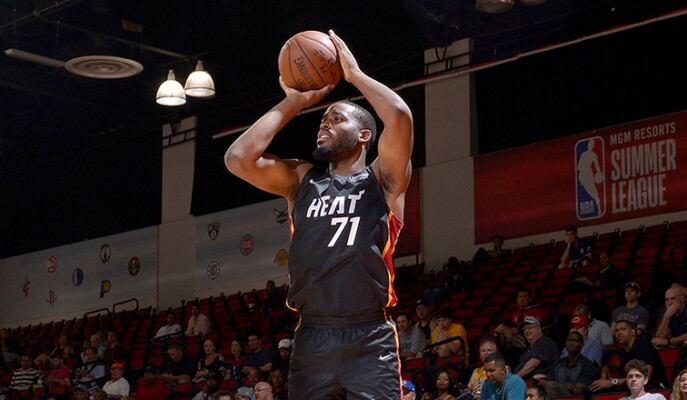 The Miami Heat announced on Sunday that they have signed forward Yante Maten to a two-way contract. Maten becomes the second Heat player on a two-way contract after Miami signed Duncan Robinson earlier on in July. Maten appeared in seven games total (one start) during Summer League and played well, averaging 10.7 points and 5.6 rebounds while shooting 44.6 percent from the field as well as 38.5 percent from three. The University of Georgia product went undrafted after a stellar college career where he averaged 14.7 points, 6.9 rebounds and 1.6 blocks per game. Maten was named All-SEC three times in college, making the first team in 2017 and 2018 and the second team in 2016. He was also named the 2018 AP SEC Player of the Year after averaging 19.3 points, 8.6 rebounds and 1.5 blocks per game. The two-way contract allows for Maten to spend up to 45 days with the Heat during the season. The rest of his season will be spent with Miami’s G-League affiliate Sioux Falls Skyforce. Maten will be able to earn up to $385,000 this season.